Morny was born in an inn near lake Geneva as the natural son of Hortense de Beauharnais and Charles Joseph, comte de Flahaut. To avoid a scandal, he was falsely given the name of a Prussian officer, Demorny. After Morny did well at school he entered the army. He distinguished himself in Algeria by saving the life of General Trezel. After his return in Paris he went into business. He was assisted in his speculations by Françoise Mosselman (1808-1880), the wife of the Belgian ambassador (Charles le Hon). Fanny Mosselman was his mistress for almost twenty years. Her third child, Louise le Hon (1838-1931), was fathered by Morny. In 1842 Morny became a deputy for Clermont-Ferrand. He supported king Louis-Philippe and had little interest in politics. But after the events of 1848 he became a member of the circle around his half brother Louis Napoleon and he supported his coup d'état in December, 1852. Morny became Minister of the Interior, but after six months he resigned. Officially because he disapproved of the confiscation of the Orléans property, but in reality because Napoleon III refused him a more important place in the government as a member of the Bonaparte family. He went back to financial speculations and in 1854 he became president of the Corps Législatif until his death in 1865. In 1856 he attended the coronation of Alexander II in Russia and he returned with a wife. He had married Princess Sofia Sergeyevna Trubetskaya in St. Petersburg in 1857. This finally put an end to his affair with Fanny Mosselman (she was devastated). Morny and his princess had four children. In 1862 Napoleon III created him Duc de Morny. Morny held influence on the emperor and his liberal views also made him acceptable to the opposition. He was instrumental in the preparations of a liberal empire that was to ensure the future position of the emperor's son, but his health gave way. Napoleon III and empress Eugénie visited him in Paris just before his death on March 10, 1865. 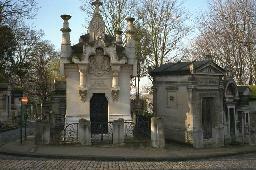 The mausoleum of Auguste, Duc de Morny at Père Lachaise, Paris.